A few months ago, Alicia and I decided we should take a short vacation — somewhere close by, just for a weekend, to get away and hang out. We picked San Diego, as I had spent a summer there and might make for a good tour guide (or so we thought). I plotted and schemed and we eventually both asked for a mid-August Monday off to make our travel worthwhile. We flew out of San Francisco on Virgin America, a first for me — a lucky choice, too, as we were quite late getting to the airport, and they have a terminal separate from the main SFO terminal, so security was a breeze. The flight was quick and smooth, except for one enormous burst of turbulence just before landing in San Diego which had everyone grasping their seats. Saturday started out with a quick drive to Balboa Park, where we grabbed lunch at The Prado, visited Spreckels Organ Pavilion, and wandered around. We eventually headed over to the San Diego Zoo, a must-not-miss stop on our trip (and Alicia's only specific request). 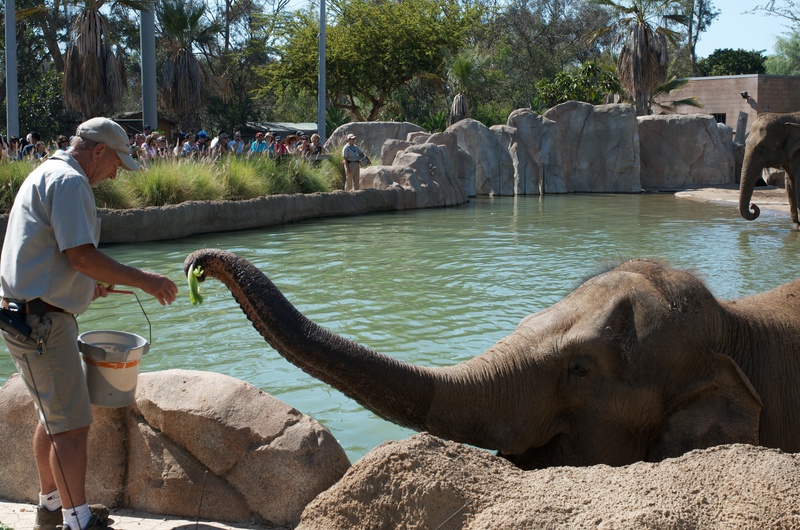 It's a fantastic zoo, and we spent hours wandering around and watching the koalas, elephants (always my favorite! ), and strange birds. You can see the elephants featured prominently in the one-minute summary video. I actually don't remember seeing the giant koala exhibit on previous trips, but I love them, so that was a pretty awesome treat. They weren't particularly active (ok, they were pretty much completely asleep the whole time), but maybe that's for the best; they're cuter if they're not screaming at things and being aggressive. Exhausted after the zoo (I walked ~18k steps that day, which is something like 6x a lazy Cupertino day!) , we headed to Coronado, our second night's destination. Alicia — who did all of our driving — was a bit apprehensive about driving across the giant bridge, but did wonderfully all the same. The bridge is ridiculous, but provides a good view of both the city and the island (as long as you're not the driver!). 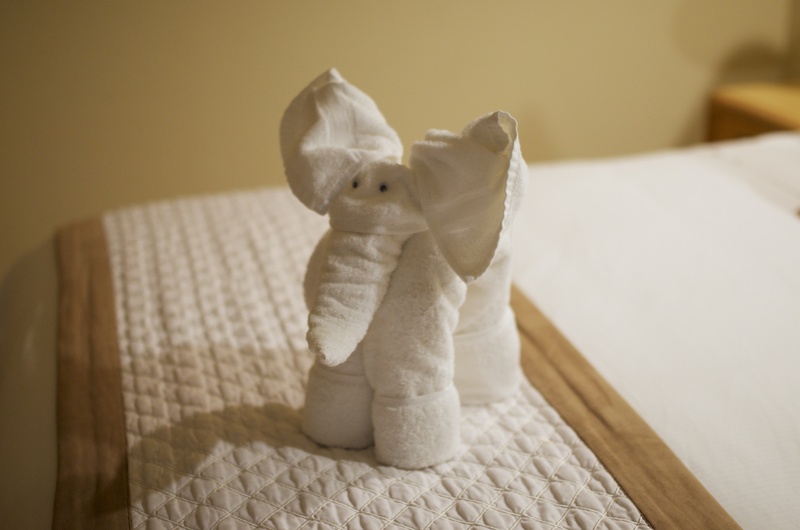 We had a hard time leaving him behind the next day, as you might imagine. After getting our shoes sandy, we headed up to my old summer hometown of La Jolla, a return I was dearly anticipating. La Jolla was a good temporary home which I much prefer to the Bay Area — even though the South Bay has been pretty awesome to me — so it was nice to be back. 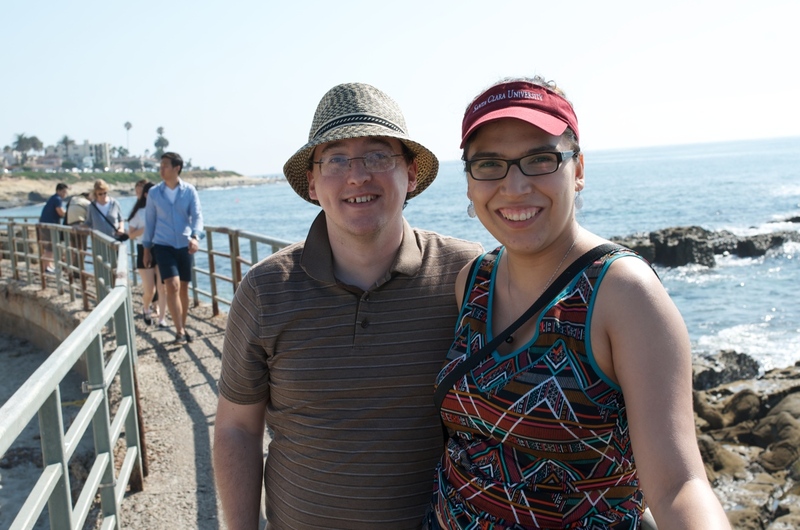 We quickly headed down to the shore, wandering along La Jolla Cove, entertained by the birds, people, and adorable seals that call La Jolla their home. A few hours were spent walking on the rocks and beaches along the coast, and Alicia made sure to touch (but not enter!) the Pacific, resulting in sandy hands, resulting in a desire to wash them in the ocean, lather, rinse, repeat, etc. Adorable, of course! After a good dose of seals (and a bit of Alicia's habit of chasing down bees for photo opportunities), we checked in for our third and final evening, at the Grande Colonial, right in the middle of downtown. 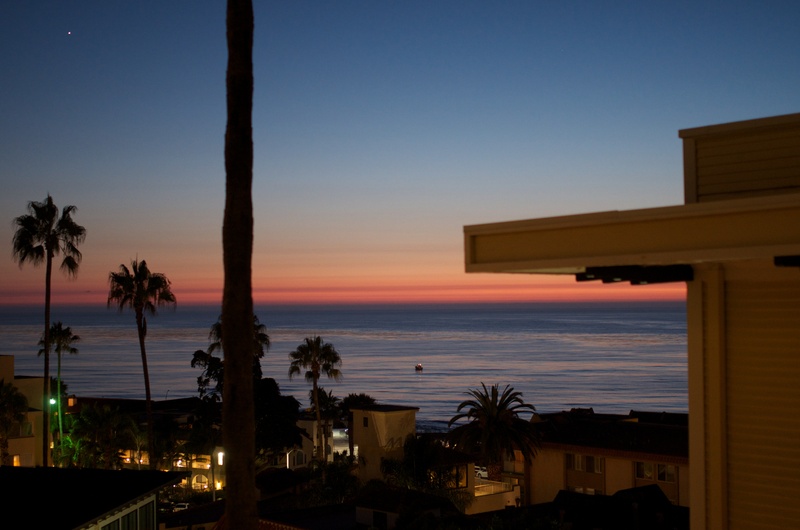 For whatever reason, they gave us an "ocean view", which provided us with a pretty awesome Pacific coast sunset. Dinner was an old favorite (actually, the same place I went for my 21st birthday, three years earlier, with my family), Whisknladle. I can't even begin to describe how awesome this place is, from the food and service to the music and overall atmosphere, it's just pretty much perfect. Alicia later noted that she particularly enjoyed it too, so it's not just nostalgia, I swear! To round out an awesome day, we took a somewhat-freezing-cold nighttime dip in the pool, something I haven't done (even in a warmer scenario) in a long time; a welcome chance to relax after our adventures. As Alicia said "french toast" when I asked her about breakfast on Monday, we headed off to The Cottage; they do french toast a bit over the top — a stuffed variant, with fruit inside and such. Quite delicious, but I think our breakfast was probably enough for the next week or so. Stuffed and happy, we headed up to one of my favorite places to go when I lived in La Jolla, the Torrey Pines Gliderport, right next to the Salk Institute. There's a bench on the south side of the launch area where the whole world just fades away. All you can hear is the breeze and the ocean far below — very serene — and I was extremely glad to get to share that with Alicia (after having excitedly described it, repeatedly). Unfortunately, there were no gliders in the air for us to watch, but we had a good time anyway. We rounded out the day visiting Seaport Village, where we perused (and purchased) Mexican tiles and peered at the giant boats across the bay, and Horton Plaza, which we stopped at for a short time to rest (and because of the silly name?) and look around. And then it was time to head back north, our perfect little weekend trip behind us, but with the promise of many more ahead of us!